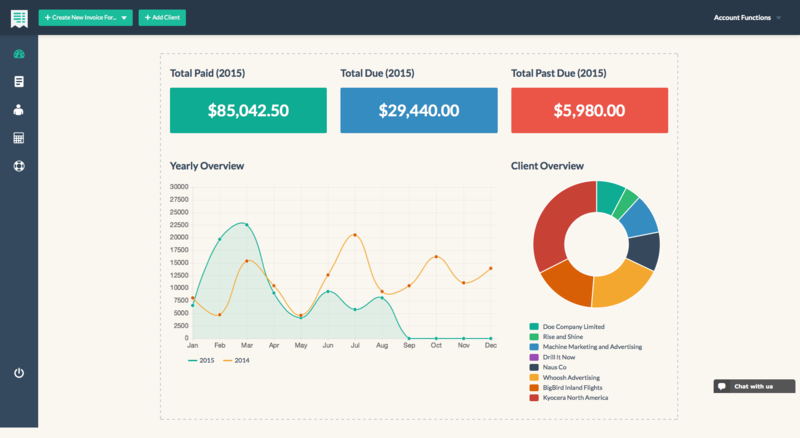 Innvoice – The last invoicing and billing application you’ll need! After years of dealing with half-assed invoicing and billing software, we were fed up and decided to build our own, the result: Innvoice! One of the things we struggled with when using other invoicing applications, is that virtually all of these products are geared towards internet professionals such as web developers, designers, programmers, consultants, etc. And unfortunately this extends to the invoice structure; nearly all billing products out there force a certain invoice item structure upon its users. We decided to make Innvoice suitable for any type of business, not just Internet and IT professionals. We accomplish this by giving the user total control over the invoice item structure. This makes Innvoice suitable for businesses like camp sites, massage therapists, day spas, car mechanics, hair salons, handymen, landscapers, etc. You get the picture; Innvoice works for any sort of business! Another feature we found missing from most other applications out there, is the option to import invoice data from spreadsheet programs like Excel. Many people operating small to medium sized businessed use spreadsheets to manage company data. So we thought it makes sense to allow users to prepare their invoice data in an spreadsheet after which they can import it into Innvoice. Getting paid is the whole reasoning behind sending out invoices, no? Therefor, what good is an invoicing application if it does not allow to you receive your hard earned cash? We have built Innvoice in such a way that it easily integrates with Paypal and Stripe, allowing your customers to pay their invoices direct online using either their Paypal account OR their credit card. As a third option, Innvoice allows customers to pay by means of bank transfer. In this scenario, the customer will be asked to upload a payment slip or other proof of transfer when submitting their payment. Another featured we always wanted from our invoicing/billing software, was the ability to generate recurring invoices. Create the invoice once, mark it as “recurring” and let Innvoice know what the recurring period is (you can choose between 1 month, 3 months, 6 months or 1 year) and Innvoice will do the rest! It will automatically generate a new invoice based on the profile you have created for the initial invoice. We work with our invoicing software daily and we love looking at beautiful things; so making the UI as beautiful as we could was the only way to go! Build using Bootstrap 3 and Flat Ui Pro, Innvoice is 100% responsive and looks just as awesome on that big screen monitor as it does on your mobile phone! Clients – Innvoice allows you to manage all your clients. For each client, the graphic summary gives a bird eye’s view of its current situation. Invoices – Create and manage your invoices. Setup recurring invoices. The flexible invoice item structure allows you to create invoices for any type of business. Export invoices as PDF and/or email invoices directly to your client from within the application. Payments – Keep track of payments. Clients can (optionally) pay their invoices online using their Paypal account or credit card. Add payments directly into the application. Multi currency – Innvoice is multi-currency and allows you to create invoices for every single currency out there! Reporting – Quickly and painfully generation of reports gives you all the info you might need at any given moment. RESTful – Innvoice comes with a fully functional RESTful API (info included in the documentation) allowing you to integrate Innvoice with other applications and / or services. 100% responsive – Innvoice is 100% responsive and looks just as beautiful on your phone as it does on your desktop computer! Clear and precise documentation – Invoices comes with well written and easy to understand documentation which is accessible from with the application. Easy and painless installation – Innvoice comes bundled with an installation script which handles the nitty gritty for you. Upload the files, run the installation script and you’re good to go! Sleek dashboard – The dashboard page gives you a quick but clear overview of the current situation!